With Christmas on Saturday, this week's menu is quick, easy, and cheap. I have stuff for two recipes I didn't make last week, so those are rolling over to the beginning of this week (this is why I save my vegetarian meals for the end of the week - so that meat doesn't go bad if I don't make the recipe!). 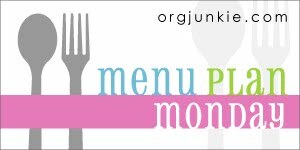 Check out more menus at Org Junkie. Saturday: Merry Christmas! More on this menu later!